All About Artichokes – The ultimate artichoke guide – learn the history, plus tutorials for cleaning, prepping, and cooking in a variety of ways. I grew up on the Central Coast of California, a peaceful stretch of countryside halfway between San Francisco and Los Angeles. At six years old, I started second grade at a brand new elementary school in our neighborhood. As part of the opening year festivities, students were asked to write an essay about something important to them. 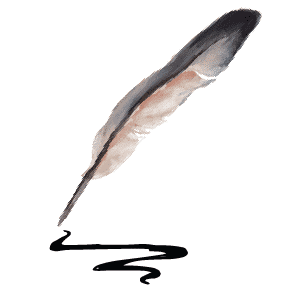 Those essays were sealed in an airtight canister and buried beneath the playground in a “time capsule” in hopes that a future generation would someday discover them. As a class, we thought long and hard about what our individual topics would be; after all, these essays would someday be unearthed and “discovered.” It had to be something important, something substantive and moving. In the end, I chose a subject that I felt passionate about… a topic that resonated with me on a deep, emotional level. I wrote about artichokes. Looking back, I suppose it was sort of an odd food to obsess over. Artichokes are not exactly “kid friendly” vegetables. The strange, prickly, cactus-like plant might even cause one feel intimidated, but I’ve always loved them. 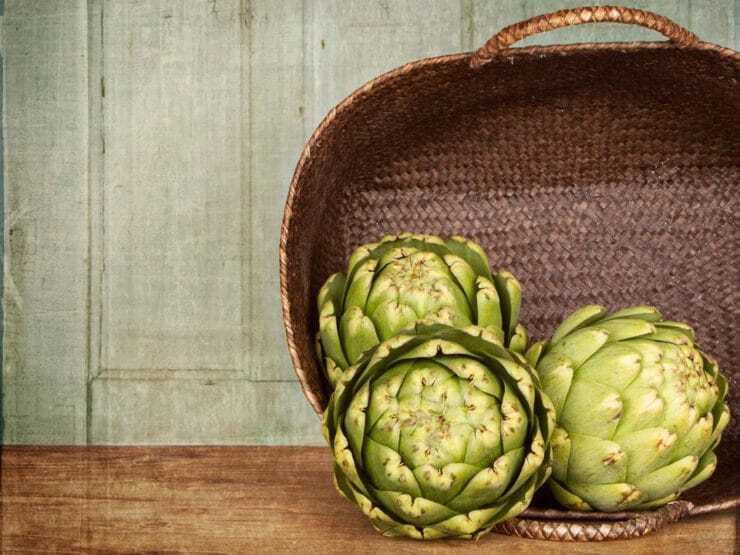 Eating an artichoke is like hunting for buried treasure—scraping the leaves with your teeth, each one giving you a tantalizing taste of the sweet heart in the center. It takes work to get to that heart. Like anything worth having in life, the greater the challenge, the greater the reward. There is nothing so delicious as a tender steamed artichoke heart. Artichokes are actually young, unopened thistle buds from the daisy family. If left to mature, the flowers can reach up to 5 feet in height. They are descendants of a similar thistle plant known as the cardoon, which can still be found thriving in the wild. 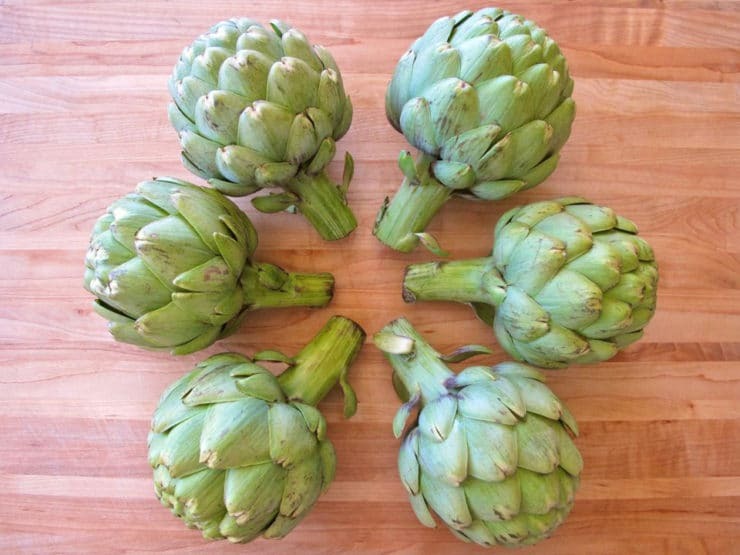 Unlike cardoons, the artichoke is now exclusively cultivated for food. Its thick green petals, formally known as bracts or phyllaries, are topped with tiny thorns. The long stem has a fibrous, woody texture that resembles a young tree branch. It’s a very odd looking sort of thing. You would be hard-pressed to convince the uninitiated that it’s even meant to be food. And yet, when properly prepared, artichokes are a savory, delectable treat. The exact origins of the artichoke are unclear. Culinary historians have debated over whether or not artichokes were enjoyed by the ancient Greeks and Romans, given mosaics that depict what appears to be the same thorny flower. These are now widely believed to be cardoons. Most historians agree that artichokes first appeared in the Mediterranean basin. Though we don’t know exactly when they became recognized as a food source, we do know that artichokes have been eaten by Jews for several centuries. The Talmud states, “one may trim the artichoke […] on a festival” for cooking. The ancient Israelites even had a special unit of measurement for artichokes called kundasa. By the 11th century, after the Moors began cultivating them in Spain, artichokes were adopted by Sephardic Jews. There are now over 50 varieties of culinary artichokes in the world, but here in America we are most familiar with the Italian green globe variety. 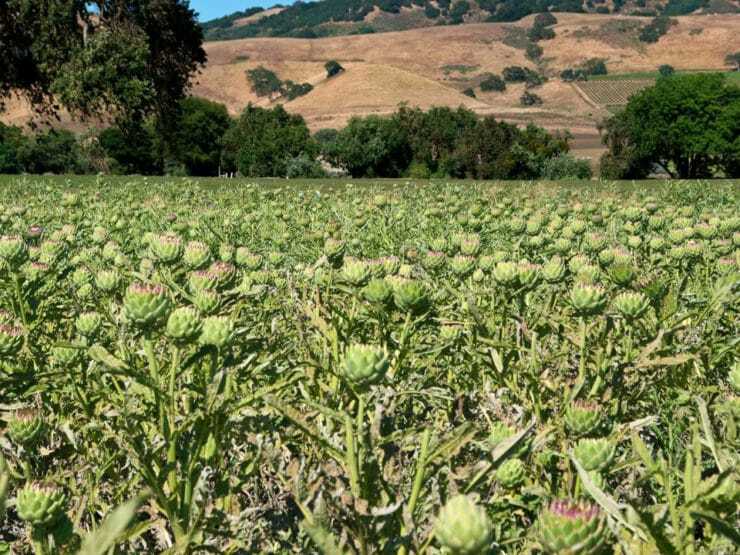 Earlier this year, I was thrilled to hear that the artichoke was chosen as California’s official “State Vegetable”—fitting, since my home state supplies 100% of the globe artichokes available commercially in America. The artichoke’s journey to California began on the East coast where French allied soldiers introduced them to America during the Revolutionary War. Globe artichokes began appearing in Virginia around the 1720s. In California, the artichoke was not seen as a favorable cash crop until the 1890s, when Italian farmers in Half Moon Bay planted them. By 1904, they were filling boxcars with artichokes to send to the East coast. In 1922, the Italian farmers moved their artichokes to California’s Salinas Valley, where they have been growing ever since. 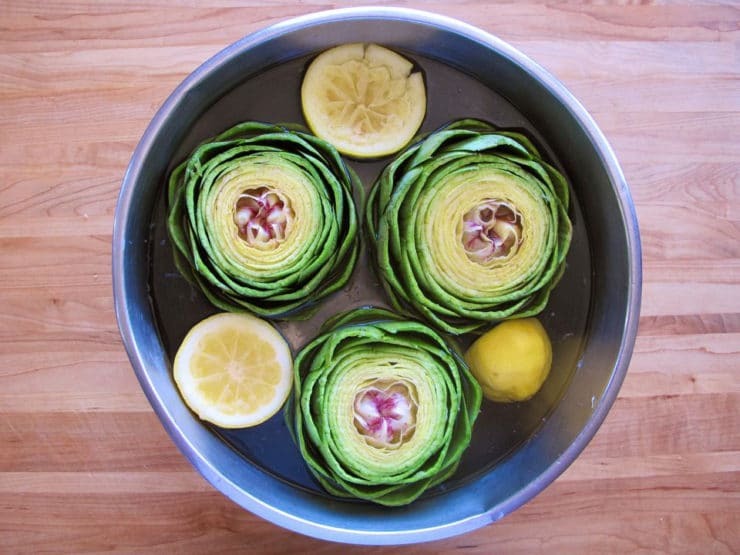 There are many ways to prepare artichokes. They can be steamed, boiled, grilled, and even fried. I grew up eating boiled artichokes, but have since learned that steaming produces a more predictable result. Smaller baby artichoke hearts, available in cans or jars (and seasonally available fresh during May/June), can be used in salads and sautés. Marinated baby artichoke hearts are particularly popular as a pizza topping and in salads. Larger artichokes can be served raw or cooked as an appetizer, side or entree, and are best served with a sauce to compliment their flavor. I have created photo tutorials for some of the most common large artichoke preparations, which I have linked to below. I’ve also linked to a special fried Jewish Italian artichoke recipe that is beyond delish. Highly recommended. Next spring I’ll share some tutorials on baby artichokes. No matter how you serve them, artichokes are pretty much the best thing ever. It’s true! Just ask my second grade self. What’s your favorite way to eat artichokes? Note: Strictly kosher Jews have their own guidelines for cleaning and consuming artichokes, which differ from the tutorials that appear here. If you’re concerned, you can learn more on the OK website. Greenspoon, Leonard J. (2005). Food and Judaism. Creighton University Press, US. Marks, Gil (2010). Encyclopedia of Jewish Food. John Wiley & Sons, Inc., Hoboken, NJ. Smith, Andrew F. (2007) The Oxford Companion to American Food and Drink. Oxford University Press, UK. Sonnante, Gabriella; Pignone, Domenico; Hammer, Karl (2007). The Domestication of Artichoke and Cardoon: From Roman Times to the Genomic Age. US National Library of Medicine National Institutes of Health, Annals of Botany, n.d. Web. 23 Apr. 2013. Toussaint-Samat, Maguelonne (2009). A History of Food. John Wiley & Sons, UK. Wright, Clifford A. (2001). Mediterranean Vegetables. The Harvard Common Press, Boston, MA. Wright, Clifford A. (2009). Did the Ancients Know the Artichoke? Gastronomica: the Journal of Food and Culture, vol.9, no.4, pp.21–28, n.d. Web. 17 Jul. 2013. Italian seasoning. Sauce is 1/2 c Best Foods Mayo (full fat) stirred first, 1 rounddd tsp. Chilli Garlic Sauce (Asian section) 2-3 tips each Tamari (aged and mellowed soy sauce – used with nut brown butter in all my steamed veggies – added as heat is turned off to carmelize). These four ingredients make the most amazing artichoke sauce ever! Sauce should be light pink and thick enough to easily coat leaves. Stores well in refrigerator. Hope you can try it, from one gourmet cook to another… Bon Appetite! I studied abroad in Rome a few years ago and completely fell in love with artichokes! Carciofa alla giudia is definitely my favorite. My grandmother is Spanish and she makes an alioli I like to put on the steamed artichoke heart. I´m a big fan of just steaming them for about 20 minutes and then peeling off the leaves and scraping the tender parts of the leaves off with my teeth. It´s a lot of effort but totally worth it. Saw it grilled on cooking show…got to try it!!!! Love Carciofi Brasati. Sweat lots of onion, add lots of garlic, 1/4 tsp. pepper flakes and thyme, 2 C. chick. broth, 1 C. white wine, a box of artichoke hearts, raw meat (if using), braise 30 mins, add options: cooked white beans, kielbasa, chicken, shrimp, saffron. Finish with fresh lemon, salt and lots of pepper. I LOVE artichokes!!! wonderful blog, I had no idea they had Jewish roots. Oh I like that! I bet they are good that way! Like mine boiled and dipped in Miracle Whip…..nummy. Stuffed Italian style, delish. My aunt used to fry breaded baby chokes, perfect, light, crisp never greasy. Wish I knew her secret!!! Very good tutorial! I lived on artichokes in college. I haven´t had them in a long time so this makes me want to make them again. I´ve never had them fried but would like to try them that way. Thank you! My favorite way to eat them is if somebody else prepares them. I´ve never had them fried. They look fabulous. They would be perfect for Chanukah… If only they were in season then. Tori… this is a work of genius. So much research! That was quick! Thank you. Now that you´ve made this primer, I feel obliged to try a lot more different ways. The heart, drenched in melted butter with course kosher salt and a glass of red wine. Oh, I <3 them on the grill! Steamed, with a nice lemon-garlic dip; or just the bottoms, marinated and cut into a salad; or the marinated bottoms on toothpicks as appetizers. Mix ingredients together. I aim for a tangy/sweet taste. I don’t remember where I got this recipe but have used it for decades now. Steamed, then picked apart and leaves dipped in mayonnaise and butter….oh, and sprinkle with a little salt and white pepper. Been doing that way since I was a kid at my grandparents´ in California. YUM! Yay! Can´t wait to do the grill! Stuffed with cream cheese, onions and capers and deep fried. I´d still like to know who thought ´let´s eat one of these!´ seems the most unlikely vegetable – but I LOVE them – thank you! AWESOME! I LOVE ARTICHOKES!!! THANK YOU! Did they ever open that time capsule? Love artichokes! Thanks for posting this! I really do appreciate it…this coming from a huge artichoke fan!! I love artichokes, especially when someone else cooks them…. I just had some amazing artichoke from a local deli here in NJ..stuffed, breaded and fried..not sure of the stuffing but I did taste cheese…they were out of this world.. Stuffed with breadcrumbs, Parmesan, and garlic. Thanks, Tory. You´re amazing yourself! Steamed on water and lemon slices. Homemade mayonnaise or a vinaigrette. I love them on pizzas, salads. But where I live is hard to find nice and fresh ones. I love the artichoke! Thank you. neveer grilled one…gonna try…i just love butter.